Monica and I have fulfilled our dream of exploring the west coast of Scotland and the Orkney Isles in a VW Camper Van. I loved it so much I don't know what to tell you. 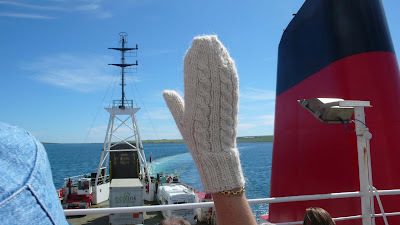 Monica bought some mittens made out of the North Ronaldsay wool. I wrote a blog about North Ronaldsay sheep a few weeks ago - they are the ones that eat seaweed. What we didn't anticipate was that the wool is really waxy and floppy. I bought skeins of grey, brown and white. Here is a picture of Monica's mitten waving goodbye to a beautiful holiday.